Siacoin (SC) is getting a lot of attention lately and there is now a new fork of the miner available made by Genoil (source). The Sia GPU Miner fork by Genoil is for OpenCL, though it works on both AMD and Nvidia and provides some performance optimizations along with other interesting features such as the ability to load external OpenCL kernel file that might be useful for people that want to try modifying or optimizing the CL file. Genoil reports that his optimized OpenCL kernel is capable of providing roughly +18% performance increase on a 7950 and we are seeing some performance boost on Nvidia as well, though more like 3-4% boost on a GTX 970. Nevertheless the fork by Genoil does offer some performance improvement over the Siacoin default miner as it has taken that OpenCL Go miner kernel as a base and even more improvements could be possible for faster performance. We have a working 64-bit Windows binary available for download below that you might want to try. 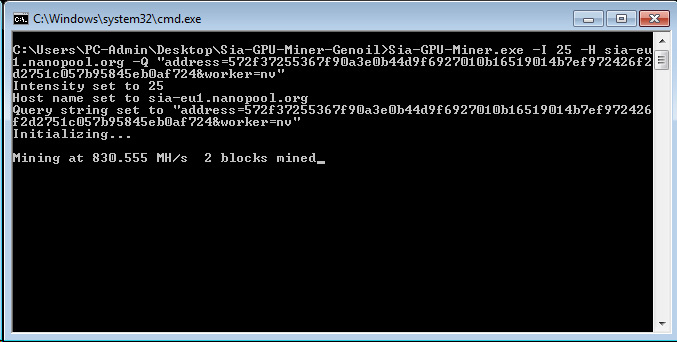 We have tested it and can confirm that it works on both Sia Nanopool and Siamining pool, though for some reason the hashrate reported by the miner is a bit higher for Nanopool than for the Siamining pool. Do note that this miner does require you to run a separate instance for each GPU in your system, it will by default run only on the first video card it finds. So while things do look very promising for this fork it apparently can use a bit more work to become as easy to be used as the Siacoin Go miner and maybe even better performance wise.